The French magazine Paris Match touched up a photograph of President Nicolas Sarkozy on his US holiday, making his figure more svelte. Leading news weekly L'Express printed before and after shots, showing a distinct tightening of the area it called poignees d'amour (love handles). L'Express quotes Paris Match as saying the president's seating position made the bulge look more prominent. Paris Match said it had tried adjusting the lighting on the picture. "The correction was exaggerated during the printing process," the magazine told L'Express. 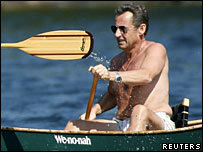 In the photograph the president is shown, bare to the waist, canoeing with his son. L'Express said Paris Match had "removed with the wave of a magic wand the love handles that were slightly weighing down the figure of Nicolas Sarkozy". When contacted by the BBC, Paris Match declined to make any further comment. Correspondents say the French president's US visit this month did much to improve US-French relations but was not without incident. Mr Sarkozy scolded two US photographers trying to take shots of him on Lake Winnipesaukee during his stay at a luxury villa in New Hampshire. French media pressure on the financial details of his US holiday also forced him to reveal he had stayed as the guest of two wealthy families.